Assembly went fairly well with no real issues along the way except for the bi-color LED polarity which was found in the on-line instructions. This board has thermal ground pads which makes soldering easier! Kit had about 18 extra common resistors/capacitors left over. 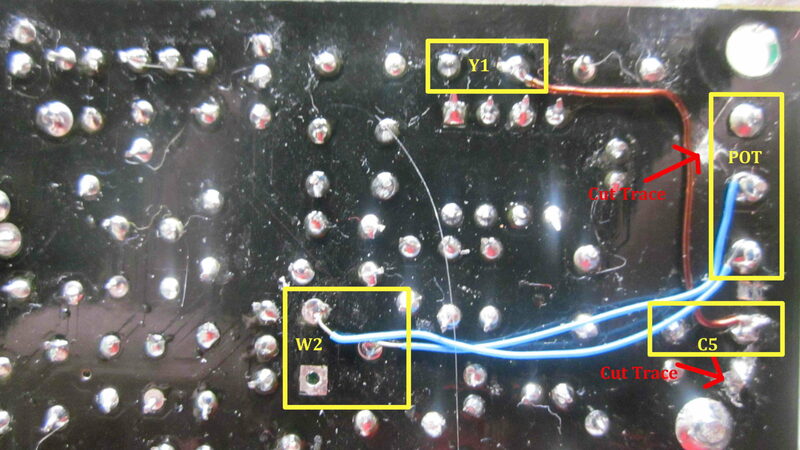 Again machine pin break away headers were used to easily QSY the crystal frequency. 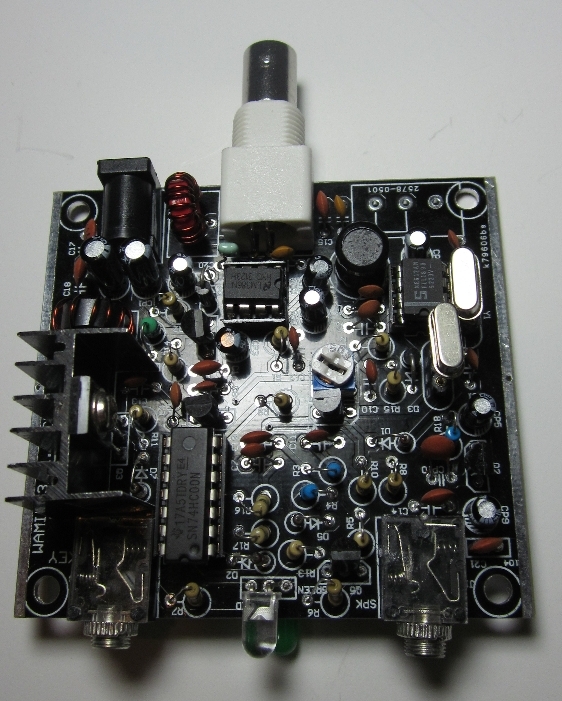 The W1 RF gain POT was left out and a bypass jumper wire on the bottom of the board was used. See below for mod. CP10 reduced from 22uF to .1uF, looks like better QSK? Receive seems to be good, even more sensitive than the Pixie above! However, I find the audio a bit low and use my CALF filter for extra audio gain and filtering. What a difference with extra audio! Note: the Pixie gets a nice AC buzz when running on a power supply. The Frog is CLEAN sounding. Moving the RIT control quickly creates an effect where the audio is quickly muted and returned back with a slow 3-4 second AGC type effect. RIT itself is working. The Receive/Transmit bi-color 5mm LED had an anemic green light. Replaced with separate red and green LED’s. Notice the green LED ALWAYS remains lit, even in transmit. It’s harder to see with the other units 3mm bi-color LED but it appears always on as well, just the RED overpowers it. Very low Transmit power. 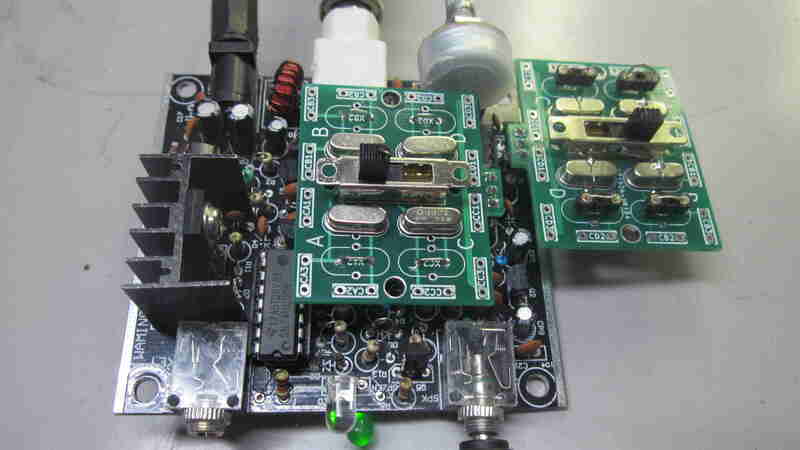 These are specified to be 1.8W transmitters at 12VDC. However, only about 400mW has been obtained. Once I figure out this issue we’ll put it on the air and see what it’s really got! Update: Changed the Q1 driver from a 9018 to an 8050SL. This doubled the power, still not even close to the 1.8W specification but now running about 750mW. “AGC” effect solved! Thanks for N7EKU for giving me a few ideas of where to start looking. I noticed a small change in the oscillator amplitude when changing RIT on pins 6&7 of the NE602, not enough to really think there was an issue. However, when looking at the signal at the RIT diode there is a HUGE change in amplitude. Also on pin 4 (output) of the NE602 you can see a big change of 75-150mV 7MHz signal (along with <10mV AF) as well as a 250mV DC change. This DC change is causing CP8 to charge and discharge as the RIT is changed. Since the swing is large, 250mV, and the AF is small, <10mV, the LM386 amplifies this DC swing temporarily muting the audio until the capacitor normalizes. Changing CP8 from 10uF down to 1uF greatly reduces (but not eliminates) the effect while still allowing lower audio frequencies to pass through.